Yes, I know this is a travel blog. But it seems that the “travel hacker” and “slick deal” crew are one in the same. It’s all about getting miles, meeting minimum spend on credit cards, and making money for future trips. This is an example of a deal that is amazing if you take the time to figure out all the tricks. Combining a few deals you can get 45% off at Staples with the Staples coupon and other tricks below. Right now, until October 13th, there is coupon for 25% off your purchase of regular priced items (there are some exclusions to note including Apple products and all computers). So if you are shopping for a brand new “widget” that is priced at $100, you will pay $75 for it with the Staples coupon. When you pay with Apple Pay and Discover IT card enrolled in the cash back promo, you will get 22% cash back. That is $16.50 cash back so now your widget only costs $58.50. Ask a friend for their referral link (or email me for one) to get an extra $100 sign up bonus. If you are a regular shopper at Staples you can get an additional 5% back for a future purchase with their Staples Rewards program. Assuming you will use that credit, you have an additional $3.75 of savings, bringing down your cost to $54.75 — over 45% off at Staples! However, you will not earn any miles or points since Discover IT is purely cash back. In addition, you may be able to leverage this deal even further by purchasing a regular priced item that also has a Staples Easy Rebate. For example, this case of paper is $29.99 regular price, and this is the price it will ring up at the register. However, you also get a code for a $20 rebate. It should be eligible for all the deals above since it will ring up at the “regular price”. If you need the paper, that is great, they are paying you to take it. However, for me (someone that doesn’t use much paper), getting paid $3.57 isn’t really worth the effort. Especially when you consider some of the money won’t come back to you from Discover IT for up to 13 months. This deal is scalable (meaning you can purchase up to 4 boxes of paper), so you could make $14.28 off of it. And have 20 reams of paper. Where this deal gets even more interesting is if you can purchase an item that you can then resell on Amazon. Hypothetically, if you sold the above 4 boxes of paper on Amazon for $10 each (after FBA fees and shipping), you would then make a $50+ profit. Paper isn’t going to make you money through Amazon, but there may be other items that could. 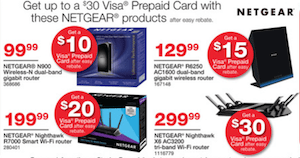 For example, these routers are “regular price” but also come with a rebate good for a Visa gift card. The N900 router could be sold through FBA for $99 and is ranked #188 in Computers and Accessories on Amazon, so should sell pretty fast. Even with Amazon fees and shipping you could turn a significant profit. Valid in Staples® U.S. stores only. Discount applies to regular-priced items only. Cannot be combined with any other discount or coupon. Limit one coupon per customer, nontransferable. Not valid on desktop or laptop computers, tablets, netbooks, Apple®, Bose®, Canon® ink, Epson® ink and toner, Home Automation, JBL®, SquareTrade® warranties, Staples® EasyTech(sm), Steelcase®, Ultimate Ears®, Wacom®, self-service print, computer workstation, faxing, promotional products purchased on staplespromotionalproducts.com, outsourced print, outsourced print, gift cards, mobile phones and services, phone cards or postage stamps. Each item purchased can only be discounted by one coupon, applied by cashier in the order received and prior to tax. Coupon not valid if purchased or sold and must be surrendered. No cash/credit back. Not valid on prior purchases or purchases made with Staples® Procurement or Convenience Cards. Coupon value does not include tax. Expires 10/13/15.